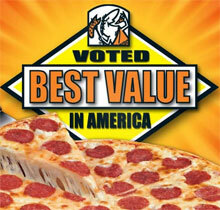 A new report has ranked Little Caesars as the best value in the quick service (fast food) industry. The report is part of Sandelman & Associates Quick-Track research studies which tracks consumer behavior and attitudes for all major fast food chains. Surveys for the report were conducted among more than 84,000 quick service restaurant customers in 70 major markets across the US. Little Caesars was also ranked highest among pizza chains for "Convenience of Locations" and "Speed of Service." "Customers are telling us that Little Caesars Pizza is the best value in America," said Brian Pattison, vice president, midwest operations, Little Caesar Enterprises, Inc. "This recognition...clearly validates our market position as the value leader." Little Caesars built more stores in the U.S. in 2007 than any other pizza chain and today is the largest carry-out chain internationally with restaurants on five continents.